The last time I was in Venice was nearly two years ago. It was in mid June and Venice was teeming with visitors. We took the vaporetto which was jam-packed with passengers bound for St. Mark's Square. It was scary full. 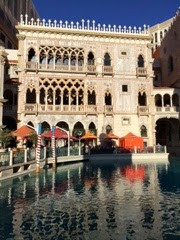 And I had no view of the beautiful palazzos that line the canals. So nice to see a replica of the Ca' d'Oro's façade in Las Vegas. This 15th century palace is my favorite building in Venice. It's all about the balconies, each one with its own distinct personality. Disguised against the black of night, who would think that this tower is on the Strip and not in the City of Light? Were it not for the building in the background, this scene could be mistaken for Paris! Clouds dot the bluest sky inside a shopping mall. It's nice to be indoors when it's smouldering hot outside and have a glimpse of the sky, faux though it may be. We all dream of having a beautiful garden. Preferably without weeds. Just flowers in bloom and green grass all year round. Which is why I just love to see the seasonal floral display at the Bellagio Conservatory and Botanical Gardens in Las Vegas. I know I will never be able to plant healthy blooms such as those at Bellagio on hardpan soil. But I have great expectations anyway. These larger than life lady beetles are made of hundreds of red carnations and are surrounded by a sea of mums and kalanchoe. And the frog prince reigns contentedly amidst yellow, red, and blue flowers anchored by a pavilion draped with stars and stripes banners. The frog prince is appropriately clad in what else? - kermit chrysanthemums, reindeer moss, green coffee bean and sheer moss. A little whimsy goes a long way. Bicycles with floral baskets tossed idly against a wooden railing and a ticket booth signal lazy days ahead. Message: don't rush. Just enjoy the long, hot days of summer under the shade. I finally had the chance to enter the Chihuly Gallery at City Center in Las Vegas recently and marveled at the beautiful pieces that were on display. 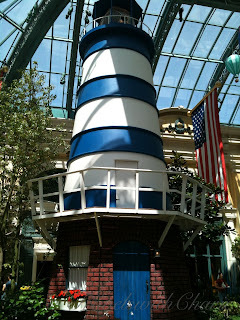 I was riveted to the Lime Green Icicle Tower which is almost floor to ceiling in height. It was mesmerizing to stare down at the reflection of the Tower on its mirror base and to check out the individual "icicles" up close. I love the cubicle idea where there's a niche for the smaller artworks. The colors are amazing! Here's one of the pieces up close. I believe this one belongs to his Persians series. Below is a better picture (than the one I previously posted) of his Cobalt Reeds and Spears. 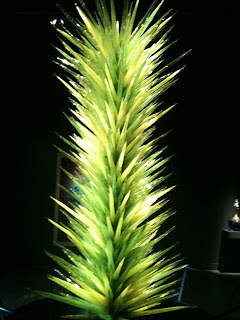 The Gallery also features paintings by Dale Chihuly. Hours are from 10am - 11pm Sundays through Thursday and 10am - 12am on Fridays and Saturdays. The Bellagio Hotel in Las Vegas consistently produces one of the best floral displays. 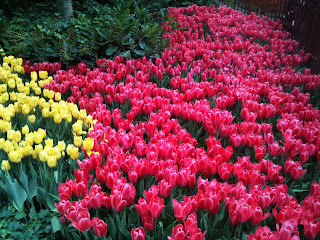 This spring, the botanical garden is awash with tulips. What a sight to behold amidst the slot machine jungle! This carousel sits in a field of blooms - violet colored mums, yellow tulips. The Bellagio Hotel changes its floral theme every season. It's always fun to see what each season yields. The inspiration of this floral arrangement comes from a landscape painting by David Hockney which is currently on exhibit at the Bellagio Gallery of Fine Art. The exhibition entitled "A Sense of Place: From Monet to Hockney" continues through January 9, 2012. There are a lot of whimsical touches such as shown above. Entrance to the botanical gardens is free. What a relaxing way to spend with family and friends admiring the happy colors of Easter. And I love these parasols hanging from the dome of the Via Bellagio shops. It's just so s﻿pring-y! We couldn't get into the Dale Chihuly Gallery in Las Vegas as there was a private event the afternoon of our visit so we had to make do with admiring Chihuly's works through the glass window. The images were a challenge to take because the reflection of outdoor lights and the Lumia fountain in the central courtyard compete with the works of Chihuly. Despite that, this group of blue glass candles or reeds of blue ( I don't know the title of this work) is a showstopper. We saw enough to make us want to come back for more. Hopefully we'll be lucky on our next visit and get a closer look at these beautiful chandeliers that are bursting with color. You can see through the delicate glass vases and coffee table art. Notice the varying hues of orange of these floral inspired bowls. The Dale Chihuly Gallery is at Aria at City Center on the Strip in Las Vegas. It's refreshing to see how the City Center Complex has transformed the Las Vegas skyline with its brash and dynamic architecture and its fine art collection thoughtfully displayed in public spaces. I love to walk around the complex and discover a Henry Moore in one of its courtyards or a Claes Oldenburg en plein air or stop and gape at the leaning Veer Towers and be mesmerized by the incredible and colorful works of Dale Chiluly in one of the galleries. Even at Crystals Retail District there are a number of artworks like the Ocean Club Restaurant inside a treehouse that rises up three stories (picture above). Here are more images to give you a bird's eye view of the new Complex. From Venice to Paris is a short walk. Vegas triumphs with its own Arc de Triomphe! Oops, someone got a little out of hand. Graduation week! Whenever I'm in Vegas, I make it a point to go to Bellagio to see its botanical gardens, it's Gallery of Fine Art exhibitions, and the hand-blown glass flowers by Dale Chihuly. 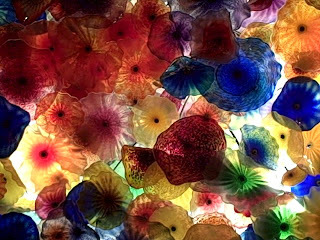 What an explosion of colors these 2,000 glass flowers create suspended as they are from the ceiling above the reception area of the hotel! Nothing says "Welcome" better than these warm and tropical beauties. Las Vegas never fails to entertain. Even the non gambler will find an embarrassment of things to do starting with a relaxing day at the spa, a visit to one of several art museums, watching free Strip shows like the dancing fountains at Bellagio or the volcanic eruption at the Mirage, shopping at Caesar’s Forum Shops or at Fashion Mall, ATV driving across the Nevada wilderness, or indulging the palate at one of many fine restaurants like Postrio or Spago’s. During the holidays there are the added attractions of gingerbread houses, Christmas décor that would please Santa, the kids and the child in all of us and techno lighted tannenbaum rivaling the colorful neon lights of the Vegas skyline. All these make strolling along the Strip at night a must for all visitors.